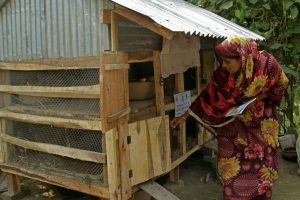 This webpage shows poultry messages which you can share with your neighbors. Invite them to see your poultry farm so they can see it in practice. 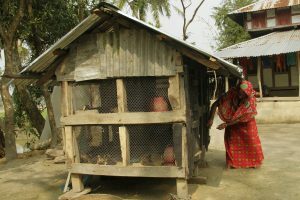 A henhouse should provide shelter from rain and protection against predators. It should provide a healthy living environment for the birds, so it should have enough ventilation for fresh air. You can make doors or windows covered with wire mesh. For hygiene, it is also important that the henhouse should be easy to clean. Place the henhouse under some shade to protect it from full sunlight. If you prepare a two storied henhouse you can keep more birds on a smaller space. Each story should be at least 2.75 feet high. Divide each story in 2 or more rooms so that you can keep adult chickens and chicks separate. The size of the henhouse depends on the number of birds. While the mother hen is taking care of chicks she will not start laying eggs. Keep the chicks with the mother hen for just 1 week and then separate them. The mother hen will then start laying new eggs much sooner. Put the chicks apart in a henhouse where they are protected from predators. If you separate chicks from mother hen after 1 week, you will have more cycles in a year and higher production of eggs and chicks. 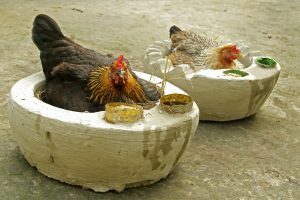 Brooding hens are often reluctant to leave the eggs. They will not eat and drink and will often lose a lot of weight. 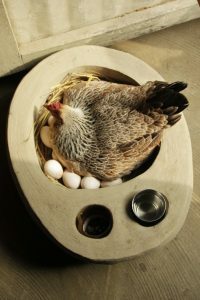 If you use a hazal, the brooding hen can eat and drink without leaving the eggs. The hazal helps the hen remaining stronger and healthier and she will take better care of her chicks. There are several diseases that can make your animals sick. 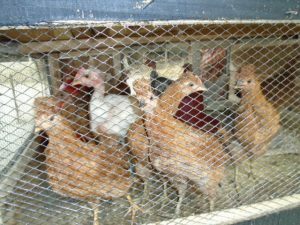 These diseases can cause high mortality especially of your chicks. Important diseases are: Newcastle Disease (Ranikhet), Fowl Pox and Fowl Cholera. Proper vaccination protects your chicken and chicks from these diseases. If you vaccinate your animals timely they will be healthier and there will be less mortality. Find a Community Poultry Worker in your area who can provide vaccination services. Not all eggs are fertile and can produce chicks. 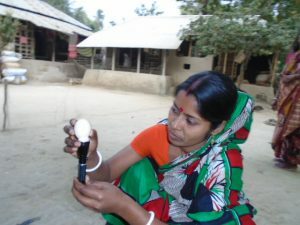 You can check which eggs are fertile by “candling” them with a strong torch. If you candle your eggs after 5 days you will know which eggs are fertilized and which are not. After candling, leave the fertilized eggs with the brooding hen to get new chicks. Eat or sell the infertile eggs. 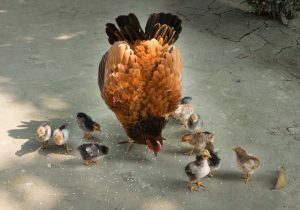 Chicken and chicks grow better and stay healthier if they get balanced feed. Provide 50-60 gm balanced feed to each chicken per day. Chicks need feed as much as they require. 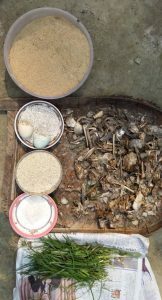 All these ingredients are available at farmer’s home and can be used for making chicken feed. You can also use commercial chicken and chick feed. Commercial feed is more expensive than making your own feed, but it has all the required nutrients for healthy birds. Make sure that you are aware about all income and expenses. This helps you to calculate the profitability of your pond. 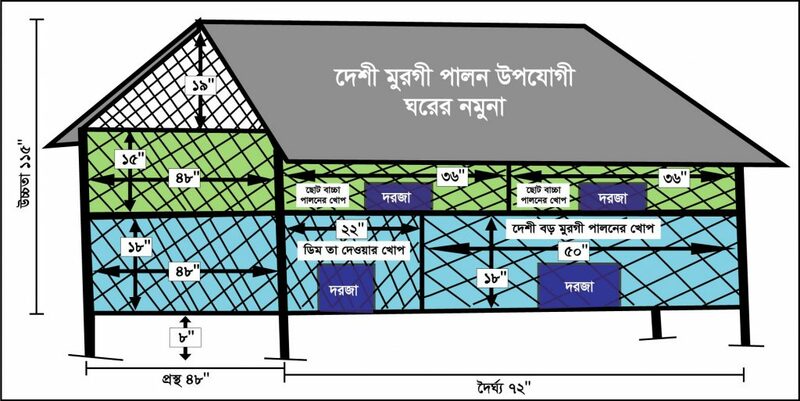 After some months you can then calculate the net benefit of your poultry farm. Share your knowledge with your neighbors and friends.